The wait has been painful...except Amazon's announcement today of its Kindle Fire has perhaps changed the game...and maybe my mind. 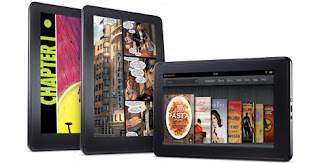 For $199, I could get a sweet Android tablet with all the benefits of the Amazon "ecosystem." I'm already a big fan of Amazon and Android. I own an Droid 3 and had a Droid before that so I am comfortable with Android O/S and the apps, even if there are less in the Android Market than Apple App Store. It does worry me a tad that supposedly Amazon stripped the Market app and only has its own appstore. I haven't compared the 2 libraries, but it seems like the most popular apps are in both stores. Here's a good video of someone demoing the Kindle Fire I found.